Source: The Binghamton Press, Binghamton, NY on Saturday, April 10, 1909, Third Section, 5. He who has been in the midst of great events is always an interesting subject, doubly so if the part he played brought him in a real life drama. 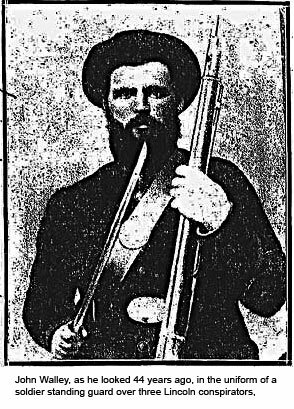 Such a man is John Wally of Deposit, Broome County, N.Y., a veteran of the Civil War, whose part in and during the closing scenes of the great epoch, to have charge of the guard of the prison where Mrs. Surratt and the other Lincoln conspirators were incarcer- ated after the assassination of the President. 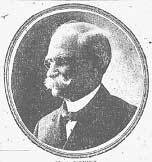 For the benefit of the readers of the Binghamton Press, Mr. Walley has related some of the incidents of those stirring stories of which his memory is remarkably full. Mr. Wally, despite his 77 years, is in full possession of all his faculties, and is as active and full of business as many men 20 years younger. He looks after his property with as much shrewdness as in his younger days, as is said to be a hired man to get the better of in a deal. When seen by a representative of The Binghamton Press a few days ago, he had just returned from a five week pleasure trip to Virginia, where he saw, among other things, the return of the At____ fleet to Hampton Roads after its world-girdling cruise. When the war broke out, Mr. Wally was living on a farm at Wallyville, 12 miles from Deposit, with his wife and three children. Along in 1862, he answered the nation's call, and enlisted at Cannonsville in the 144th New York Volunteers. He served until the close of the war and was mustered out on June 24, 1865, at Washington with the Veteran Reserve Corps to which he had been transferred by general orders about a year before. Among the unpleasant experiences of those days was the loss of a 100-acre farm through the trickery of a neighbor, and the recording against him of a judgment for $190 by the same man. Mr. Wally's enlistment was with the understanding that he might return to New York State to look after these matters, but when the Spring campaign of 1863 came on, the officers refused to give him the promised furlough, and he had to let matters take their course. The regiment went to Elmira for its equipment, and thence to Washington, where it wintered on Upton Hill; eight miles from the city. In the year that he stayed with the regiment he had many stirring experiences. The telescoping of a train made them a day late for the Gettysburg fight, and soon after that Mr. Wally began to be more or less incapacitated by illness. On this account he had a pass that allowed him to march behind the regiment, and thus had many narrow escapes from guerrillas that the main body was not troubled with. On one occasion he reached the house of a Quaker a few moments after Gray's guerrillas had left after hanging 19 Union stragglers. Mr. Wally saw the bodies hanging from trees, and immediately went into retirement in the Quaker's cellar. After lying hid for seven hours, and being fed by the Quaker, he went on, and next day met a party of stragglers and was ordered to the hospital in Baltimore. The journey to the hospital was made in cars armored with sheet iron, on which bullets beat a lively but harmless rattoo at intervals along the way. Arriving safely at Baltimore, they were dumped out on the dock, loaded on a steamer, and anchored out in the river, where the ladies of the Sanitary Corps served a bountiful dinner, one of the best he ever tasted, Mr. Wally says. From there the party was sent to the Carver hospital, two miles above Washington, where some 2000 sick and wounded were cared for. A picture of this hospital hangs on the wall of Mr. Wally's sitting room and is a prized souvenir. President Lincoln passed the hospital on his way to and from his suburban residence and Mr. Wally saw him daily. He was here about seven months, being kept here after his recovery because of his great strength and his usefulness in caring for the sick. After leaving the hospital, he was transferred to the Veteran Reserve Corps., preferring that to the honorable discharge that was offered him. The order was sent to guard Grant's ____ on the Rap_lan, and from this time on, Mr. Wally acted as captain. One of the incidents of this period was the carrying of a message to Washington, with an order from General Grant ____ ____ shot. He made this journey in the night, crossing the York river on a narrow stringer, part of the way hitching his way along with limbs astride the beam and a pine knot in one hand. He got through safely, and delivered his message. He stayed at this post almost nine months, helping to guard the Baltimore road. Another incident of this time was the arrest of a desperate man for desertion, the various guards detailed to take charge of him failing to "make good" until Mr. Wally took him in hand. The man was to be taken to Petersburg, where Grant was, and Mr. Wally was ordered to take him there. He carried out the order, partly by means of a liberal application of the point of his bayonet, but he did not stay to see the man shot. Mr. Wally's description of scenes and incidents that followed Lee's surrender is interesting in the extreme. He went to Richmond and saw Libby prison, Jeff Davis's house and other points of interest, and next day Lincoln was there, too. Returning to Washington, Mr. Wally took part in the rejoicing over the ending of the war, and was one of the crowd that heard Vice-President Johnson speak from a platform. He remembers Mr. Johnson's assertion that "rebellion is treason," and that he would "have every rebel officer as high as Haman." While in camp at Hydeville, opposite Bladensburg, they were driven out by Early's front on Baltimore. This movement was with a view to drawing the Union troops away from Washington, when he planned to swoop down on that city and sack and burn it. The presence of the Sixth corps foiled him, however, and he lost 800 men. When the flurry was over Mr. Wally went back to Hydeville and stayed until ordered into Washington. While at College Switch, which he guarded with a detail of a hundred men, Grant went by on a special train, on his trip to the Shenandoah Valley to see Sheridan. On the morning of April 14 it was ______ about the camp that Lincoln, Grant and Sheridan would all be at Ford's Theatre that evening and some of the men planned to go. Next day, while in the city after ____ for his command, Mr. Wally learned of the awful tragedy that had been enacted at the President. Grant, he says, stayed in the railroad station that night, that being the safest place in Washington and it is Mr. Wally's belief that Grant feared ______. With orders to arrest all _______, Mr. Wally's command captured about a dozen and took them to the old Capital prison at the Navy yard. Booth was 26 years old when he assassinated President Lincoln, and after his death at the hand of Sergeant Boston Corbett, his body was taken down the Potomac river in a rowboat and the place of his sepulture was kept a secret, it is said, and has remained so to this day. 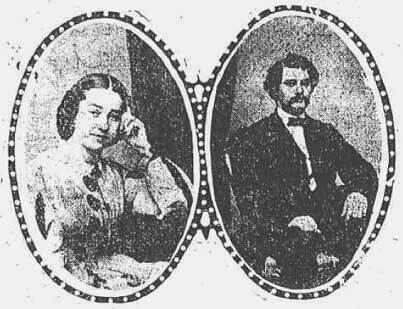 The photographs were loaned to The Binghamton Press by S.C. Wally of Cannonsville, Delaware County. to the 3,500 Confederate Prisoners Confined There. One of the blood points in the history of those days has been as to what became of the body of John Wilkes Booth, the hate-brained fanatical actor, whose murderous bullet ended Lincoln's benevolent life. Booth was shot to death in a barn about 10 miles from Washington where he had hidden after escaping from the theatre, and where he was followed and surrounded. He had taken a boy into the barn with him, but the boy came out and surrendered and was taken to Washington. The body of Booth was brought back to the city and was placed by the cellar of the Capital prison, mentioned above, pending an autopsy. The autopsy was delayed until the condition of the body took such a proceeding out of the question, and then a man was hired for $10 to take it out and sink it in the Potomac river. Mrs. Surratt, who had held the horse outside the theatre for Booth while he was shooting Lincoln, who helped him mount and escape, and at whose house the conspiracy was hatched, was arrested and placed in the Capital prison, with the boy above mentioned, and the conspirators who made the futile attempt to slay Secretary Seward at the same time Lincoln was shot. These three persons, Mr. Wally, with a detail of 30 men, was responsible for on every alternate day from the time of their arrest until they were led out to be shot. The detail was divided into squads which served four hours at stretch, and then took two hours off, until they had been on duty 24 hours, when they were given 24 hours off, and another detail took charge. These two details were on guard inside the prison, while outside, the building was surrounded by a double row of soldiers and the roof also had its quota of guards. A general officer was in charge of the prison. The other prisoners were in the third or top row of the triple tier of cells, and being under constant surveillance, and the soldiers having orders to keep silence, they must have had rather a trying time of it. The Frenchman, as Mr. Wally described the Seward assassin, was hampered with ball and chain on both wrists and ankles and Mr. Wally had to cut up his food for him when he ate. One day General Grant came to the prison and asked for admission, but the orders being strict, Mr. Wally refused him, and was later commended. Mr. Wally was in and out of the court room during the trial of the conspirators, being responsible for their safe arrival there and their safe return to their cells. On one occasion Mrs. Surratt tried to jump over the railing near her cell, while on the way to the court room, but was prevented by the guard. The height was considerable, and might have resulted in her death, which was doubtless what she thought. When the Frenchman was taken to court, two extra guards were required to carry the two heavy iron balls to which he was chained. The court room was in the prison building. When the Judge sentenced Mrs. Surratt, Mr. Wally was in the room, and he remembers that the woman asked, "What for?" when the Judge told her she must die. It was shown at the trial that she had harbored Booth for several months while the conspirators were hatching their plot. After receiving her sentence Mrs. Surratt was taken back to her cell. The chaplain visited her there, and Mr. Wally went into the cell with him. Mrs. Surratt lay on the cot with a black cloak over her, and apparently paid no attention to the words of the minister. Mr. Wally was not permitted to see the execution of the conspirators. The 144th New York Volunteer Infantry was a Delaware County Regiment. Of the Regiment's total enrollment of 1409 men, 852 were from Delaware County, 16 were from Chenango County, 15 were from Cattaraugus County and smaller numbers of men were from other counties. In August and September of 1862, the Regiment was organized and drilled at "Camp Delaware," located about a mile below Delhi, the County Seat, on the grounds of the County Poor House Farm. The Regiment was organized into 10 Companies with enrollments principally as follows: Co. A (Tompkins), Co. B (Walton and Masonville), Co. C (Delhi, Hamden, Stamford, Meredith, Harpersfield, and Kortright), Co. D (Franklin), Co. E. (Andes and Bovina), Co. F (Hancock and many from Penn. ), Co. G (Middletown), Co. H (Roxbury, Stamford, and Harpersfield), Co. I (Kortright, Davenport, Sidney, and Meredith) and Co. K (Colchester). The 144th was sworn into Federal service on September 27, 1862. They marched out from Camp at 7:30 A.M. on October 8 for Hancock, where they took the train for Elmira, this areas collection center. The 144th was mustered out of Federal service at Elmira in July of 1865 and as each Company was paid off, the men left for home.